Sample is 3/4-by 2-1/4-inch square-edge solid strip. Color: Heartwood is yellowish to orange-brown when freshly cut, turning brown or dark red- brown upon exposure. Grain: Straight to interlocked or wavy; coarse texture. Variations Within Species And Grades: Moderate to high variation in color. Hardness/Janka: 1925; 49% harder than Northern red oak. Dimensional Stability: Excellent (change coefficient .00158; 57% more stable than red oak). However, actual installations have demonstrated significant movement in use. 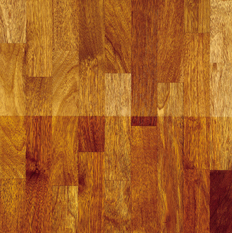 Durability: Strength is comparable to hickory, but density is somewhat lower. Sawing/Machining: Sawing is difficult; wood gums saw teeth and dulls cutting edges; carbine tooling recommended. Comments: High resistance to termites.